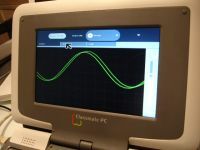 As such a harbinger, OLPC took the concept of 4P Computing, first conceptualized by the Simputer, and made it a practical reality with the XO laptop. But in the many missteps we chronicled on OLPC News, it never really commercialized its lead. Instead we are witnessing a dramatic change in the low-cost laptop marketplace. New low-cost laptops, 4P Computers, are popping up daily so I am hoping to reconvene a similar thoughtful discussion next week in San Francisco, but this time, OLPC will be but one option for us to talk about. Now not a day goes by without another announcement of a new laptop in the OLPC space with entrants from the practical Asus Eee PC to the seemingly comical Van Der Led “Jisus laptop”. The largest operating expense for that school is the diesel fuel for the generator at this point in time. That includes airfare and living expenses for the volunteer teachers that teach there. That includes computers, amortized over 5 years. That includes building and maintaining the school. Getting diesel fuel to power the generator is the biggest ongoing operating expense. To reach any level of market penetration, computers must be highly energy efficient, mainly to allow them to run off solar or other alternate energy sources, including human power. High energy efficiency also reduces heat waste, negating the need for a fan or other dust openings in the form factor, increasing processor lifespan. If you look at any cybercafÃ© in the developing world, you’ll see people actively engaged with computers, but only using a few applications. Web browsing, including web-email and video watching, listening to MP3’s, creating documents, and doing light calculations. These activities do not require high processing resources. In fact, the more progressive Internet cafÃ©s are using thin clients sharing a single processor. What people do want is easy-to-use hardware and software that does not need constant maintenance. Specifically, software that resists viruses, the bane of any beginner user who doesn’t understand the real malice lurking online. Oh and software that is essentially free. This type of computing device must be portable. That means both lightweight and small enough to carry around in a backpack or under a child’s arm, and yet rugged enough to survive such portability on a daily basis. Ruggeness extends from a strong physical design, down to water and dust resistant cases, solid-state memory, and screens that can be read in daylight. Yet weight cannot exceed a few pounds with 2 kilograms the maximum upper limit. At that point both the physical effort to carry the machine and its mass if dropped, make it impractical for developing world environments where dedicated computer rooms or home offices are rare. There, most activity happens in a communal setting, be it the living room, dining room table, or front porch. Computing will need to bend to this model. Why did Nicholas Negroponte start with the “$100 laptop” moniker? Because people understand price, they respond to a barrier breaking move, and $100 is a nice number to dream about. 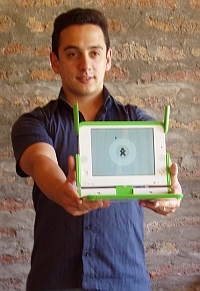 While $100 is still a dream for OLPC, even the $400 G1G1 reality has set a new price point. At $400, the growing middle class in Africa, Asia, and South America can buy their first computer, no matter what Annette Jump at Gartner says, $400 may be a month’s salary to many, but computers were a month’s salary in the US until not too long ago, and that didn’t slow adoption. Add in computing as a way to improve children’s education, and as any parent will tell you, price becomes secondary. But price still matters. At $400 or less the developing world makert will expand rapidly and a whole other market emerges. As G1G1 proved first, at least 81,000 people in America and Canada will buy a laptop, if only to tinker with it. Asus has taken that idea and expanded it with the Eee PC to about 500,000 laptops last year with a 3.1 million goal for 2008.